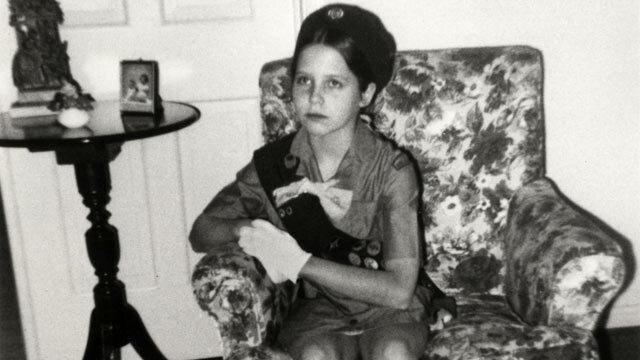 intro: More than 50 million women have enjoyed a childhood that included Girl Scouting, from alumnae Hillary Clinton and Mariah Carey to Dakota Fanning, Condoleezza Rice and Katie Couric (pictured here in uniform). Juliette Gordon Low of Savannah, Ga., couldn't have imagined 100 years ago today, when she organized the first Girl Scout troop, that her legacy would span 145 countries. Here are recollections from a few prominent women who experienced first-hand the mission of building "girls of courage, confidence, and character, who make the world a better place." quicklist: 1 url: title: Katie Couric category: Girl Scouts' 100th Anniversary text: Troop No. 2165; Arlington, Va.; fourth through sixth grades. "Girl Scouts taught me some of the basic and essential principles and values that I still hold dear today, like being truthful, helpful and independent. But it taught me some hard lessons, as well. "One Sunday the girls in my troop were instructed to bring something fun to prepare for a cookout. My mom and I went to the grocery store for supplies, and I was very excited about cooking a steak sandwich. That seemed almost exotic to my fifth-grade self," said Couric, a special correspondent for ABC News and former CBS "Evening News" anchor. "My friend Janie McMullan didn't have anything to bring, so I told her, 'Don't worry! I have enough for two!' Like a good Scout, I shared my groceries and we both were able to whip up steak sandwiches. As my mouth watered, my chest puffed up with pride. "But when it was time to vote for the person who brought the most creative dish, much to my chagrin … Janie McMullan won. My bubble burst like one of the balloons tied to the picnic table, but I kept my feelings to myself. "The lesson I learned that day is a simple one: Sometimes life isn't fair. It can be tougher to swallow than a steak sandwich, but that's the way the hoagie roll crumbles." quicklist: 2 url: title: Judy Woodruff category: Girl Scouts' 100th Anniversary text: Troops in Germany; Tulsa, Okla.; Taiwan; and Augusta, Ga.
"I was a Girl Scout for about nine years, starting as a Brownie in second grade in Mannheim, Germany, where my father was stationed for the U.S. Army," the television news anchor and journalist said. "We moved to different posts as I grew up -- at Fort Leonard Wood, Mo., then to Red Bank, N.J., and Tulsa, Okla. -- where I joined the Brownies or Girl Scouts for a short time, before moving to the next place. "I have memories of living in Kaoshiung, Taiwan, in fifth and sixth grades, where I attended a school run by the U.S. Navy, and where there was an active Girl Scout Troop. We had many activities, took trips around the country, visiting Buddhist Temples, for example, and meeting together with the (then) Taiwanese equivalent of the Girl Scouts. "Back in the United States, I stayed in Girl Scouts in Augusta, Ga., through 10th grade -- earning many badges -- always wanting to earn more! -- going on camp-outs, making friends. I have so many fond memories of the Girl Scouts. "For me, Girl Scouts provided a way to learn about the world, to build character and although, I didn't realize it at the time, leadership skills. It exposed me to all sorts of things I would never have otherwise known about at the time -- arts and crafts, outdoor skills, boating/sailing (which I didn't get to try!) -- and especially to a wonderful group of girls who had great values, and great fun. It broadened my horizons in an important way and I'll always be grateful to the Girl Scouts for that." quicklist: 3 url: title: Cathy Rigby category: Girl Scouts' 100th Anniversary text: Born in Los Alamitos, Calif.
"The thing I received from Girl Scouts more than anything else was a sense of real teamwork and working for the community, helping others, and it was not competitive," the former Olympic gymnast and TV commentator said, according to the Girl Scouts of Southwest Indiana website. "I remember working as a group to achieve a goal or to help the community. There was a great sense of accomplishment in that." quicklist: 4 url: title: Hillary Clinton category: Girl Scouts' 100th Anniversary text: Troop 316; Park Ridge, Ill., beginning in 1954, 2nd through 8th grades. "As a Brownie and then a Girl Scout, I participated in Fourth of July Parades, food drives, cookie sales and every other activity that would earn a merit badge or adult approval," Secretary of State and former first lady Hillary Clinton wrote in her memoir, "Living History" (2003). quicklist: 5 url: title: Martha Stewart category: Girl Scouts' 100th Anniversary text: A Nutley, N.J. troop. "Girl scout camp at South Mountain Retreat (in Orange, N.J.) taught me the real love of the outdoors, camaraderie and friendship," Martha Stewart, the magazine publisher and TV personality, said. quicklist: 6 url: title: Lisa Ling category: Girl Scouts' 100th Anniversary text: Born in Sacramento, Calif.
"The Girl Scouts is where I became acquainted with the idea that a woman can do anything," journalist Lisa Ling said, according to the Girl Scouts of Southwest Indiana website. "Learning that early on has a tremendous impact on the development of a young girl's personality. It had a huge impact on me. Girl Scouts is where I first learned about philanthropy and fell in love with the concept of helping others, in my troop this was very important. We did a lot of community service like picking up trash and feeding the homeless. Loving humankind was something that echoed throughout my time at Girl Scouts." quicklist: 7 url: title: Natalie Merchant category: Girl Scouts' 100th Anniversary text: Born in Jamestown, N.Y.
"I think the most enduring lesson I was taught through my experiences of being a Girl Scout was that I was a member of a larger community," singer-songwriter Natalie Merchant said, according to the Girl Scouts of Southwest Indiana website. "I out-grew my uniforms and badges years ago, but the memories of visiting nursing homes or organizing Earth Day tree plantings or my summers camping with girls from all different backgrounds will stay with me always." Who Is This Famous Girl Scout?